In developing the Graduation to Certification program, we are using evidence-based principles from research about memory, learning and cognition. The book, Make It Stick: The Science of Successful Learning, lays out this research. 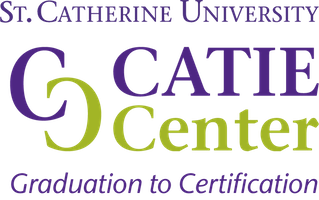 Peter C. Brown, who is the principal author and is a consultant for our project, talked with Patricia Gordon who teaches at St. Catherine University. Here are a series of excerpts from that conversation, as well as ASL translations of the content created by Eileen Forestal and Janis Cole. Click here to see a more comprehensive conversation about the big ideas of the book. Learning is about getting it out, not putting it in. This excerpt from the conversation is 1:27. Patricia Gordon: I just want to introduce you. This is Peter C. Brown. He is one of the co-authors of the fantastic book, “Make it Stick: the Science of Successful Learning.” The book is from Harvard University Press. And if we were going to distill down some of the key findings, could you explain a couple of those for us? Peter C. Brown: I found the whole process really intriguing – to learn the science and then to try to animate it through stories of real people and incidents in their lives. And how they handled them, and how that revealed the fundamental learning, and the science of how we learn. I came away at the end, thinking that, for me, there are really four big ideas. The first one is that we think of learning as getting stuff into the brain, but it turns out that learning really happens when we struggle to get stuff out of the brain. It’s that effort to recall, explain, relate, put in our own words, something new or a new skill or semantic knowledge, that really leads to the learning. Moving the new material from short-term memory into long-term memory and connecting it to what we already know. So, getting it out, not trying to put it in is key. And most of us, when we’re trying to get something, we’ll just re-read and re-read and try to re-expose ourselves to it. To burn it in. That doesn’t work. This excerpt from the conversation is 1:44. Peter: The second big idea for me is that there are some kinds of difficulties that are, in fact, desirable for long-term learning. I’ve made the point that trying to get learning out of the mind is an important strategy. It turns out that if you space out your practice so that you’ve gotten a little rusty on the new material, it takes extra effort to retrieve it, that added difficulty causes the mind to reconsolidate the learning. And it strengthens the connections to what you already know. And the cues to retrieve it again later. Peter: Like the 20-foot put. Or in baseball, you know a typical strategy would be to swing at 15 fastballs. Then 15 curveballs. Then 15 change-ups. And in practice, you can see a lot of improvement. But if those 45 pitches come randomly, you really struggle. Because each time you’ve got to figure out what kind of a pitch it is, and how to hit it. You don’t think you’re doing too well. But later, when you’re tested with random pitches, you do a whole lot better. So, this idea of mixing up your learning. If you’re trying to identify bird species or the works of painters, it doesn’t feel like you’re getting it. But you get a much more nuanced understanding and ability to transfer that knowledge to unfamiliar settings. So, mixed practice is, uh, interleaving the practice of similar problem types, is a very powerful difficulty that is desirable. And there are some others as well. So, there are certainly difficulties that are not desirable. If you read something in a language you don’t know, that’s an undesirable difficulty. I mean, we can think of many undesirable difficulties. But not all difficulty is undesirable. There is power in a growth mindset. This excerpt from the conversation is 2:12. The third big idea for me is this notion that when we learn something new, we are actually, uh, it’s not like getting a new bump on the head. But we are re-wiring our brains. Our neurons are growing a new axon to connect with other neurons. This came home to me, visually, in a video in a clip, a Nova TV clip of a neural scientist, Eric Kandel, who has won a Nobel for his work. Where you can actually see a video of a sea slug neuron being stimulated and the axon growing out to reach another neuron. It is a physical phenomenon. The point being that through the right kind of mental engagement, that kind of effort, we are changing our minds and increasing our mental abilities. Our mental abilities are not fixed with the gift of our genes. We have the ability to substantially affect our mental abilities through the right kinds of learning effort. It re-wires the brain. It feels difficult, there’s actually a reason. You’re re-wiring your brain. Patricia: You’re making a new path, yea. Peter: And this, I find, a positive feature to counterweight the ways we think some kinds of difficulties are desirable, that we know from the research. And it’s been shown that people who have this, what Dr. Carol Dweck, the psychologist at Stanford, calls “a growth mindset,” instead of a fixed one. A fixed mindset is, if it’s not coming to me, I must be dumb. It exceeds my natural gifts. A growth mindset says if it’s not coming to me, I must need to try a different way or try a little harder.That notion of persistence. And her research shows that students or other learners who understand they are actually changing their minds physically through that kind of effort, they are motivated to pick tougher problems and persist longer. So, the third big idea for me is this idea of a growth mindset. Our intuition often leads us astray. This excerpt from the conversation is 3:17. Peter: The fourth one from the research that what feels productive, often is not. Our intuition often leads us astray. And this is your 20-foot putt example. Because you can spend quite a bit of time practicing your 20-foot putt or your four-foot bean bag or your solving of the – finding the volume of a geometric solid – like a spheroid until you see you’ve got it nailed. What you don’t understand is that improvement resides in short-term memory. And it hasn’t been consolidated in long-term memory. It takes hours or days for learning to be migrated from short-term memory to long-term memory. And you walk off the golf course or leave your classroom with that practice feeling you’ve got it nailed. Or you spend all-night in an all-nighter and you do well the next day on the exam, you think I’ve locked that stuff in if you come back a week later, you haven’t. You’re astonished to discover it’s leaked away in the meantime. whether, in fact, you’ve achieved that or not. One of the benefits of spacing out your practice is you get a more honest reading of whether or not you’ve mastered the topic that you’re dealing with. Patricia: And it’s more than just looking at it, it’s actually testing yourself. Peter: It’s not about looking at it again. It’s a matter of having the question posed and being able to come up with the answer, and being able to explain the answer. Being able to elaborate on it. That is just a fundamental, important part of learning. And the impulse to re-read and review will build a kind of familiarity with the text, a fluency with the text, that’s easily mistaken for mastery. But, A: it doesn’t stick. And B: you can’t explain below the surface of the language that you’ve memorized what you’re really describing. So, that’s the challenge of moving beyond the illusion of mastery by requiring yourself to demonstrate mastery. Through quizzes, flashcards. Frequent, low-stakes quizzes are just sort of the bottom-line thing that we’ve found from this research are really important ways of locking in your learning and carrying it forward and knowing what you’ve got and what you don’t have and need practice. In this segment, Peter references a clip from the PBS show, Nova. You can view that segment here.